My clients and blog readers often ask me about what props they should use in photos for their blog and social media posts. I totally get it! It can be a lot of pressure to come up with creative content all the time. Adding photos to just your Instagram is pretty daunting. You have to come up with new photo ideas all the time just to post once, or *gasp* even three times a day. This can lead to frustration. Do you only post a photo of your chai latte once a month when you catch up with your assistant? Or are you posting photos of your cat doing silly things over and over (secretly hoping that your ideal customers love cats just as much as you do)? Or do you hide out from Instagram for six months, only to open your Instagram and feel all the shame and close it immediately…without posting anything at all? Oh yes. I see you, and I understand. We have a lot of responsibilities as business owners and it can be difficult to handle them all. I’ve been there; Instagram often gets dropped from the bottom of a very long list of to-dos, but posting inconsistently to your blog and your social media doesn’t help your followers to trust you. Take it from me. Let’s get you to a place where you can enjoy that chai tea on your photo-batch day and feel inspired by how lovely it is and by all of the branded props you’ve got ready to photograph for your brand. 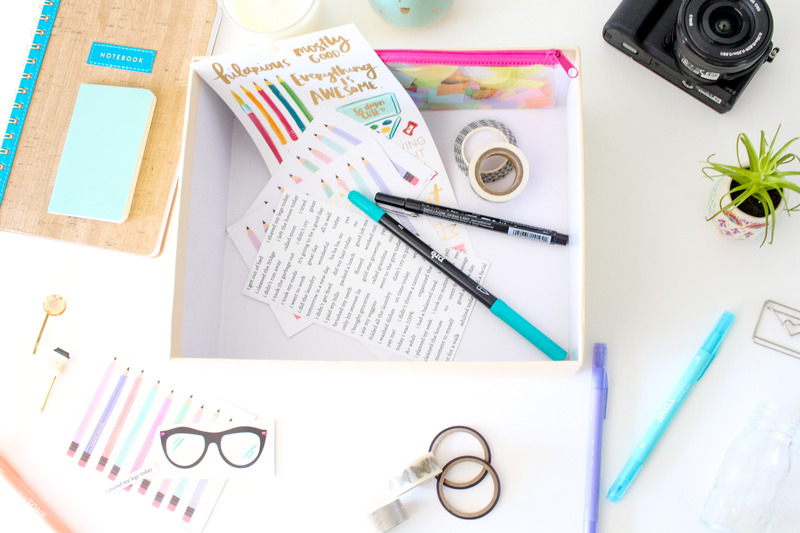 Creating your own prop box full of things you’ve chosen specifically for your Brand Personality is a game changer. It will help you post more regularly, have better photos, and feel better about the entire process. 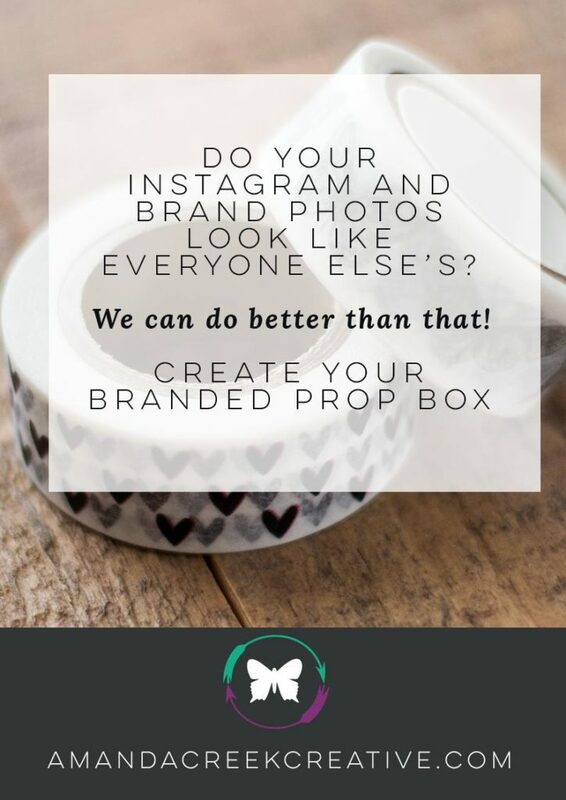 By adding a few items to your prop box each month, you will store up a variety of things to photograph that will allow you to create a library for your site and for social media. You’ll have lots of ideas about what to photograph when your photo batch day comes (mine comes usually once a week), and it will actually be a treat – not a chore. I love going into my Dropbox folder and pulling out new photos for my blog posts without having to take new ones that day. Not only am I able to draw from this library for my posts and social media, but I’m also able to use those photographs for things like free PDFs that I use for content upgrades or slides that I put together for mini courses I teach as a guest expert. I recently used my photo stash to make new opt-in forms for my website, and I updated all of the featured images on my recent blog posts, to give them a consistent look and feel. 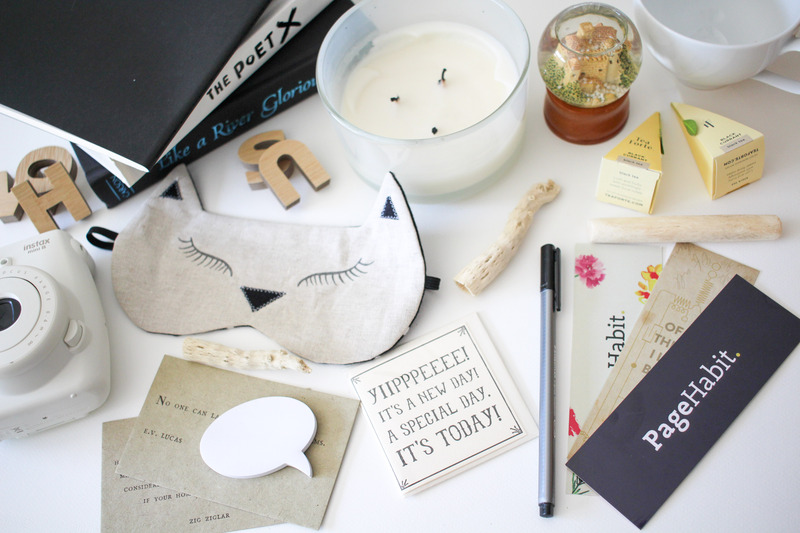 All it takes is a thoughtful plan to make sure everything fits your Brand Personality. When I’m putting together a prop box for myself to go along with my editorial calendar or for a client’s social media, I focus on the items that make sense to the overall message I am trying to convey. I go on a hunt around my house first and then later in stores or online (Hello, Etsy!). Pro tip: when planning your prop box, look ahead at your editorial calendar for your blog or social media for inspiration. I look for different things to photograph, and when I’ve found something that makes sense, I add that to the prop box. Over time, the box gets full and I can use those same props in lots of different combinations. There are lots of other places you can look for inspiration for your props. 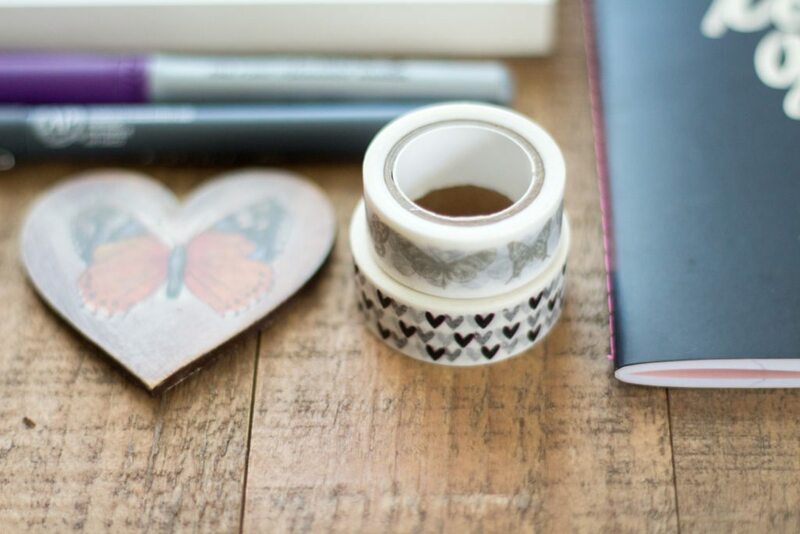 Because my business is centered around web design, branding, and photography, I have many of the items listed above in my prop box or on a list that I refer to (placed nicely within my prop box). These tools are the things that I use each and every day, or they are representations of the tools I use (like antiques and miniature versions). If I’m going to have a photo batch outside of the house, I make sure to also take out my list and add those items to bring along. Sit down and take out a piece of paper. Write out the things that you personally use each and every day. If you have spare tools, add one of the spare items into your box or basket, so that you can easily retrieve it when you take the time to take photos. If you don’t have a spare, make sure to add that list to your box, with a little asterisk beside the missing props. By taking photos of your hobbies, you can show people what you’re all about. You get to share your personality with the world. On the flipside, you can show your people that you share mutual interests. Like attracts like! By taking photos of things that your ideal clients find interesting as hobbies, you can target them on Instagram, for instance, by using the hashtags of the items in the photograph. People will come and check out your feed, and if they have similar hobbies and like your Brand message, they’ll probably stick around. Make another list of items that show your hobbies and passions. Remember that you can choose to take just a few colored pencils or paint brushes to symbolize your love of art (if you love art) – not every single one you own. Whenever you can, include the ones that go with your brand colors. 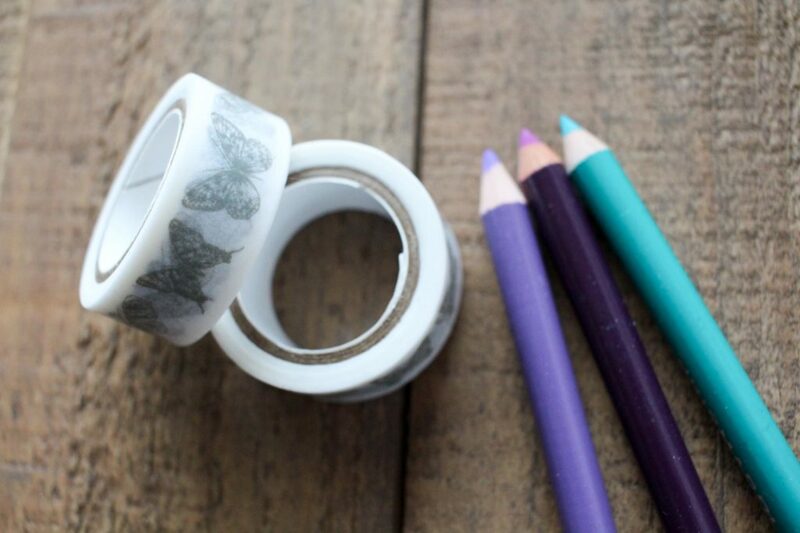 If you don’t use office supplies, you don’t need to pretend – just because it’s in other people’s photos. This is just another thing that is a big piece of my workspace, so I include it. Look around your workspace and see what kinds of things you put your hands on regularly to do your work. Then? You guessed it. Add them to the box. Look at your calendar and think about what your life and business look like throughout the year. Is there a favorite blanket you keep in your drafty studio in the winter? Do you burn candles while you work? Those are bits of you that you should share…so put them in the box. I love to scope out the things my favorite customers love to look at. My super secret insider tip is to look at all of her favorite magazines…maybe partly because I LOVE looking at magazines. It’s my favorite. I know that my ideal clients love craft magazines like the magazines by Stampington (such as Artful Blogging, Handcrafted, Bella Grace and Where Women Create), and I love looking at Flow (an amazing workbook / color pages / bookmark and sticker book / magazine for cool people like you and me). Pro tip: Look at magazines your ideal clients love to read for inspiration for photos and props for your own branded photography. Many a date night in my life has been spent in Barnes and Noble in the magazine section with a stack of magazines in my lap. I pour over the pages and look at what things are being photographed, as well as how the items are being photographed. Ask customers what they read in your next social media post, or send out an email asking about it. People love to answer those kinds of questions! This is your excuse to go get all the lovely magazines and sit with them in your lap and your phone in your hand, to gather up some inspiration geared toward the things your people love. If you’re feeling like your ideas are stale or are questioning if the items you’ve collected are too old fashioned, for instance, looking at these magazines can help you by seeing what is current and trendy. Where can you find the magical things to put in your prop box? I’m constantly on the lookout for new and exciting things to add to my prop box. I look at craft stores, stores like Target or Ross, home goods stores, as well as Antique stores and on Etsy. Pro tip: Be extremely thoughtful when putting your prop box together. You don’t want to buy things that everyone else has. There will be some overlap, of course, as that’s just how it goes with so many people posting to social media each and every day. Dollar bins at Target can be good…but you shouldn’t buy everything there, because you know that everyone else has seen that sparkly stapler too. By keeping your brand in mind and being selective, you can come up with a unique mix of items that speak to you and your Brand in a more genuine and noticeable way. When I go into a new store, I’m looking around and picking up things all the time. I take my time and walk through the entire store, adding things to my cart and then putting them away again (because maybe I don’t need that extra mug today). For some of you that may sound excruciating because maybe you’re not a shopper, but if you do this once a month and hit a new store each time it won’t be so bad. That’s a lot! How do I narrow down the choices? I like to keep four things in mind when I’m deciding what will make the cut. I don’t let color be an absolute deciding factor on whether or not you’ll add a specific item, because you can always change the color during the editing process (let me know by commenting below if you’d like to learn how to do that). I typically like to try to get things that are close to my Brand colors, because it helps me to set myself apart from the beginning. By consistently photographing things that are white, purple, and dark green, my photos are already different from photos with things that are hot pink or lime green – even if some of the props are similar in nature. Using patterns consistently is another way to brand your photos. When you adopt certain patterns into your Brand and eliminate other patterns, you’re setting your photos apart. Maybe you only use floral patterns in your photos. Perhaps you’re like me and you use a mixture of patterns that are polka dotted and striped (I wish I could afford ALL the Kate Spade ever). Whatever you decide, keep those patterns in mind when you’re shopping for your props. That will help to narrow things down and add a little pizazz to your photos. I personally use a lot of marble textured items, because I like the minimal look with a hint of that texture coming through. I have even added smaller things that are marbled to my prop box instead of just allowing the texture to come from the background itself. Texture works a lot like pattern, but gives an actual tactile feel to your photos. I like the flexibility of adding the cooler texture of marble through smaller props, so that when I’m not photographing things on top of a marble background, there’s still a hint of it in there to give that feeling. One of my favorite things to play with in my photographs is scale. I love taking photos of miniatures, because it’s fun and unexpected. By adding in a different scale of an item, I’m able to add some fun and variety to items that I feel like I’ve photographed 1,000 times already. When you play with color, pattern, texture and scale, you will be able to find a truly unique combination of props in your box, so that your photos really showcase the feeling of your Brand Personality in a way your favorite customers will love. By keeping your Brand Personality in mind, you’re able to create a prop box that looks like none other. Your photos will be unique to you, and eventually your followers will notice your photos amidst all of the others they scroll past in their feed. Do you have a branded prop box? If not, what’s holding you back from starting your own? If you’re ready to create a prop box, but it feels a bit overwhelming, then head on over to my Branded Photo Prop Box class on Skillshare! I feel like you wrote this for me! I’m in the process of working on taking new images for my new mentor site. I think this info will help me tremendously. Thank You! What a great idea! I’m definitely going to start shopping for mine. You already have such nice photos! But truly it makes life easier to have them all organized in one place. And it’s so fun to go shopping for new props. Brilliant post, Amanda. Totally helpful. Just the idea of having a list to work from was a lightbulb moment for me. Awesome! I’m so glad you found it helpful, Janet! i would love to see examples of what exactly is in yours (and others) prop boxes. I actually was considering doing a comparison post in the future, to show the difference between my prop box and a client’s prop box. I’ll put it on my list of posts to do! Great post! Love the ideas, especially the checklist. So handy to take shopping. I’m going shopping this week for the box to put the props in. Any suggestions? I like the clear plastic totes that you can get from Target, because it makes it easy to see into the box. But I’ve considered wire baskets in the past and also wooden crates. It really depends on what you’ll put inside the prop box. If you’ll have smaller items that can fall out of a wire basket, then opt for something that will hold those little items and can be moved easily without losing stuff out of the bottom. Hope that helps! great tips 🙂 I didn’t even consider this before. Quick question, what would you suggest for a background (eg. white sheet) to take photos of your flatlays on? I like to use white foam board or to find a tile (that’s not super shiny/reflective).